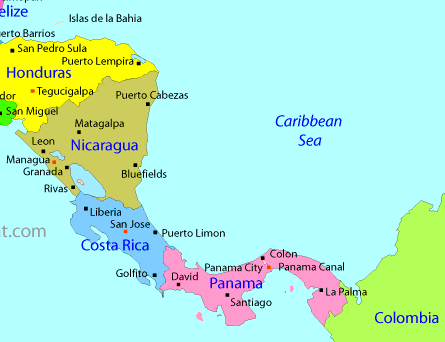 For those of you up in the US, take a look at this map…..
As you can see, the country of Panama runs east to west, so that the Caribbean is on our north and the Pacific is on our south. This takes some getting used to when you have always oriented yourself that the Atlantic is on the east and the Pacific is on the west. Here, the sun rises over Colombia and sets over Costa Rica. OK…got that? There is a big ridge of mountains that run across the center of the country…our Continental Divide. I live on the Pacific side of that mountain range, about 20 miles from the Pacific at an elevation of 3,500 ft above sea level. I can see the Pacific in the distance. If you cross that mountain range, you will be on the Caribbean side…which, as the crow flies, is only about 20 miles away as well. Of course, you can’t see it from my side because of the mountains…and it takes about 3 hours to drive there because of the mountains and getting behind big slow trucks on the 2 lane highway. OK, enough geography lessons….just wanted to orient you as I talk about my recent trip to the Caribbean side. Off the coast is an island chain called Bocas del Toro (mouth of the bull)….the main island (Isla Colon) has a large gringo population but not old retired folks…instead lots of young Americans and Europeans live there. It’s quaint and colorful….a lot like Key West in the 70’s. It has great food, cute hotels and several smaller islands with resorts and homes. Recently my friends Fran, Kris and Dan and I went for a few days. Kris had lived there for a couple of years so she knew everyone and exactly where to go. We spent two nights on Isla Colon and then took a boat over to another island further out in the Caribbean called Isla Popa. We visited a cacao plantation where they make chocolate, we went deep sea fishing and caught LOTS of tuna and bonita and saw a baby whale shark (it was about 20 feet long)….a shark took half of one of our tuna as it was being hauled in….Kris caught 2 baby sharks. It was an amazing trip and I hope you enjoy the slideshow below. When you come visit we’ll go over and you can see it for yourself.